Whereas the internet may be all abuzz about Phil Mickelson's lucky break at the Colonial, this week's Golf for Beginners show focuses in on the amateur ladies of the sport. Play Golf America, in conjunction with American Express, has had over 68,000 women attend its prior yearly outings, bringing together the art of the sport with all of the "extras" that may enhance the ladies experience. This June, participating golf facilities will try once again to peak interest in both golf and the encounters surrounding it. He believes that these additions lessen the competitive nature of the sport. Instead, teach them how to compete and then win! I think there's more to golf than that cut and dried notion. Allowing women to experience all the facets of golf may just increase the number of women who take up the sport and stick with it. The faces behind this year's initiative are Nancy Lopez and Suzy Whaley. Lopez has among her accomplishments 48 LPGA wins (3 of them majors), Whaley was the first woman golfer in 58 years to qualify for a PGA Tour event (the 2003 Greater Hartford Open) paving the way for Annika Sorenstam and Michelle Wie's venture into men's professional events. We also discuss the new American Express website dedicated to golf which offers a smattering of everything from video golf instruction to the ability to purchase tickets to 2009 events such as the U.S. Open at Bethpage. Our golf tip focuses on the Art of the Layup and how placing your ego on hold is only the first step to accurately hitting greens in regulation. In the battle of the "most fit" men in America, Tiger Woods has squashed opponent Barack Obama. The Democratic contender may be a pretty good point guard and stay away from fatty foods (whenever possible) but it just doesn't compare to Woods' rigorous training regimen and remarkable ability to successfully recover from two knee surgeries. The PGA Tour's number one golfer will just not allow defeat; what are the chances though that Obama will come out on top in November? Men's Fitness Magazine have chosen presidential hopeful Obama for it's list of top 25 of America's hale and heartiest men based on his competitive elan and basketball know-how when placing him in the list, but it is Tiger Woods who reigns supreme because of "his commitment to being the best and setting the bar, not just for other golfers, but for all athletes". As Woods' dad, Earl, claimed about his prodigious son in 1996, "Tiger will do more than any other man in history to change the course of humanity. He'll have the power to impact nations. Not people. Nations. The world is just getting a taste of his power." Will this statement also be true for Obama or will he just become a casualty of his surroundings? Last week we questioned whether or not Annika Sorenstam was taking a last stab at glory or planning to blast past the number of wins of LPGA great Kathy Whitworth. The next day we received our answer as Annika Sorenstam held a news conference to confirm her retirement from professional golf. This week's Golf for Beginners podcast gives our top reasons why Annika Sorenstam has decided to escape the rigors of the daily grind. I guess we could have added to the list her inabilty to get close to Lorena Ochoa at this week's shortened Sybase Classic but we stick to the tried and true, like her recent attempt at comedy on the David Letterman Show. Finally, we offer up a great divot drill which will help to alleviate fat shots. Try it during your next practice session! This podcast is supported by San Diego Golf Central, 1-866-825-4094. Annika Sorenstam has officially begun to chip away at Lorena Ochoa's top Rolex Ranking. A win at the season-opening SBS Open led a "Tiger-esque" charge that has remained strong through her latest victory at the Michelob Ultra Opening this past weekend. Sorenstam is back in the "feared-zone" once again! Challengers are falling by the wayside. Even Lorena Ochoa could not keep up on Saturday, pushing herself out of a chance for a Sunday duel with a disappointing 74. It was the first time Ochoa has been out of a visible top-ten spot on the leaderboard since 2007. Did Sorenstam's charge give Ochoa the jitters? With a wedding plan in the works and her increasing reliance in other golf interests, are we seeing Annika's final push for glory or the beginning of a new commitment towards "untouchable" status? I also found Michelle Wie's name on the leaderboard. She was in her usual "cut" position, a spot which seems to be more comfortable a fit as times goes on. "I just feel really rusty" claimed Wie who needs to borrow more than an oil can from the Tin Man in order to elevate her game...maybe an infusion of Annika's blood? Where Wie's game is stagnating, other LPGA rookies seem to be coming on strong. Na Yeon Choi is eyeing the Rolex Rookie of the Year Award loading up on points over her nearest competitor. Oh, I'm sorry...I thought Michelle Wie was in the race too but...that's right...she never went to Q-School and qualified like the rest of the Tour! This week Golf for Beginners discusses the challenges that Michelle Wie faces and wonders whether or not her constant disappointments as a professional golfer have helped her grow as a person. We also offer up a few easy golf tips. One simple visual we offer is where to focus your eyes when hitting the ball for best contact. Another is the role a golf companion has on your game. Is it better for you to play with better golfers or those who play more on your level? Click here for more easy golf drills. "Spider-Man", "Trendsetter" and even "Rock-Star" are some the monikers which come to mind when branding 26-year-old Camilo Villegas. Magazines are targeting him, with People voting Villegas one of its hottest bachelors and Golf Digest naming him one of the most ripped golfers on tour. 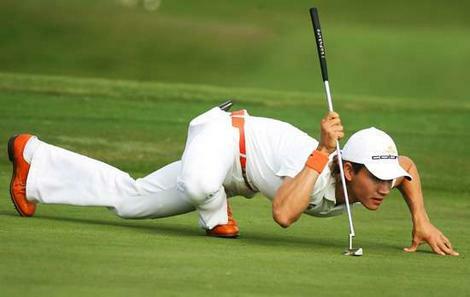 His flexible signature maneuver on the green is memorable. And ladies are attracted to his retro look from international clothier J. Lindeberg, who has been hailed as the most influential fashion designer in Sweden, claiming to have "reinvented the wheel" when creating golf fashion. Villegas seems a bit overwhelmed by the attention thrust upon him and prefers to talk about golf, not girls. "If people like the way you play, the way you dress, the way you look, that’s all good. But the bottom line is my goal is to play good golf," Camilo stated in a Golfweek interview. Take a tip from Natalie Gulbis, Camilo, and expand your horizons. Calendars and reality shows make plenty of money too and can turn Camilo Villegas the golfer into Camilo Villegas "business entrepreneur". Camilo's ability to stay focused on his golf game is one reason why we have chosen a putting tip from the up-and-coming Columbian player. Another reason for our selection is that Villegas' positive putting stats on the PGA Tour don't lie. This podcast is supported by Florida Golf and Travel, 800-514-5131.